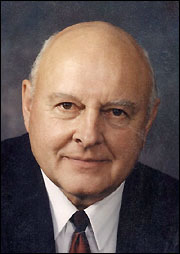 Judge Rainer Weis - who practiced law in Paynesville for 13 years and who served as a judge for 15 years - died last week. He was 82 years old. A native of Roscoe, Weis was born in 1920 to German stock. He graduated from Paynesville High School in 1939, commuting with a group of students from Roscoe each day on Highway 23, which he once described as little more than a gravel road. Judge Rainer Weis was a trial lawyer in Paynesville for 13 years and served as a county judge for 15 years. While in high school, he played football, baseball, and basketball, and he played on the Roscoe team that won the championship of the Stearns County League in 1939. But in later years he lamented the emphasis put on athletics at school, compared to the neglect of academic honors. After high school, he worked in Providence, Rhode Island, for year before joining the air force. He served actively in the air force for nearly four years. Though he intended to be a pilot, his fluency of German, which he learned at home, led him to be placed in the U.S. Strategic Bombing Survey, a branch of intelligence. After his discharge, he attended St. John's University and the University of Minnesota and worked in the pharmaceutical industry in the Twin Cities while attending law school at William Mitchell College of Law, from which he graduated in 1959. He began working at a law firm in Willmar that same year and started his own practice, doing trial work, in Paynesville in 1962, which he continued until he was appointed to the county court by Governor Wendell Anderson in 1975. He was re-elected in 1976 and 1982, joined the district court when the courts unified in 1984, and was re-elected again in 1988. Known for wearing a blue robe, rather than the traditional black, he retired from the court, involuntarily due to the state's mandatory retirement age, in 1990. Judge Rainer Weis is survived by his wife of 47 years, Mary, eight children, and two sisters. A complete obituary can be found on page 8.